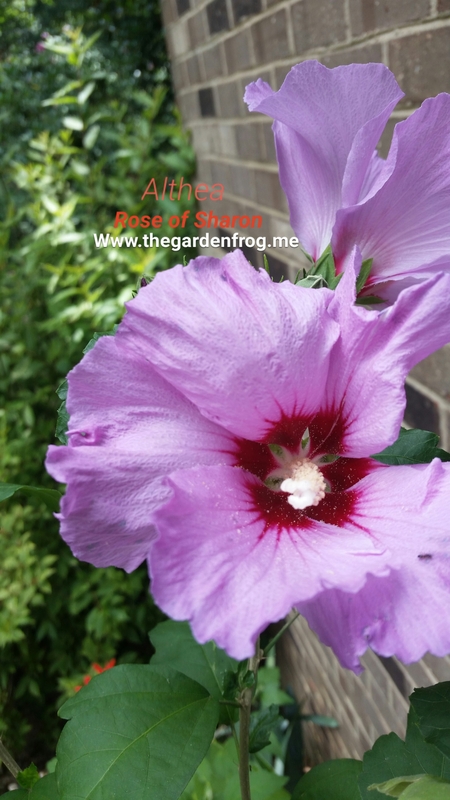 The Rose of Sharon (Hibiscus syriacus) also known as an Althea shrub is a mid summer bloomer in white, pink, red, or purple with a red center. You can also find them ruffled in the same array of colors including what many call blue. 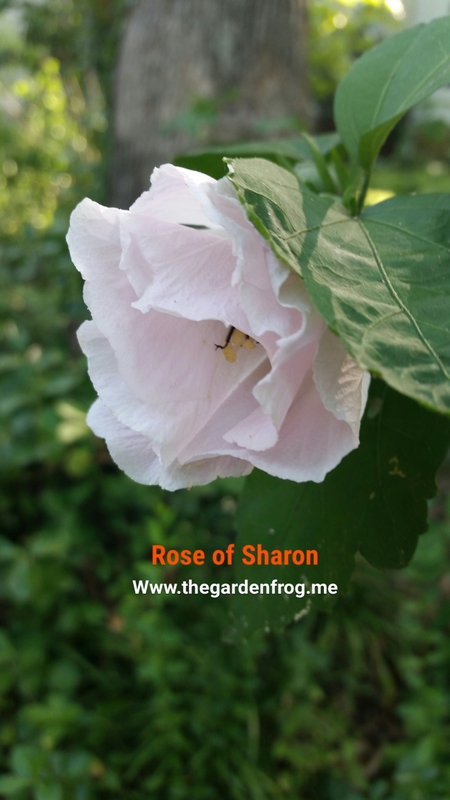 You can grow the Rose of Sharon as a shrub or a tree and many garden catalogs sell them as a fast growing deciduous flowering hedge. I have seen a listing for up to zone 11. In my zone (7) it can be invasive and pop up where the seeds may fall or the wind takes them. Many sites will tell you that the height can reach up to 10′ tall and 6′ wide but I can confirm that I have a ruffled purple one that is 8 years old and is well over 12′ tall and 6′ wide. It has never had viable seeds yet and last summer transplanted a purple one to the same area of the yard to see if that will make a difference (sometimes plants need another for cross pollination). It grows in most soils and will tolerate the hot summer sun. About 3 years ago I discovered under the Oak tree on the front corner of my property along the street quite a few seedlings. Since the seedlings were mixed in with the Wintercreeper Euonymous under the Oak tree, I just let them to see what they would do. Well, last summer 2 purple and 1 pale pink bloomed so I dug up the 2 purple ones and left the pale pink one under the Oak by the road. I transplanted one (purple) on the side of my house where it is hot and dry and I put the other one in my back yard. (I believe) the seeds came from my neighbor 4 houses down and across the street. 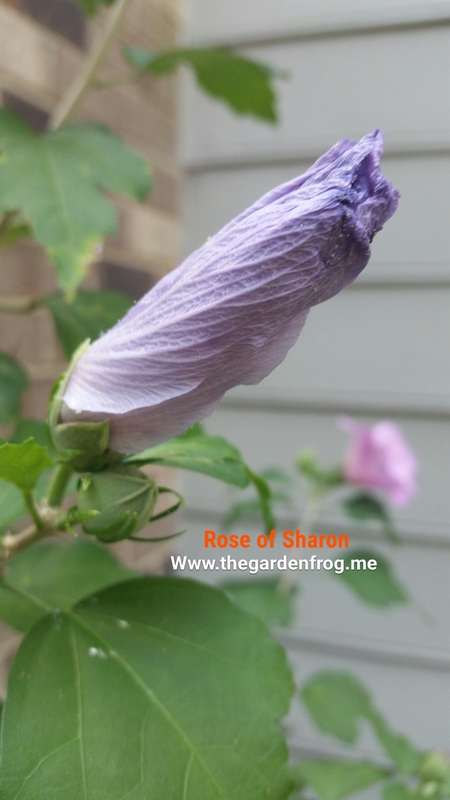 She has a purple one but no one else on my street has a Rose of Sharon that I have found. My double ruffle blooms around the 1st week in July and shortly after the others start to bloom. I have one in part shade and it has not bloomed yet but has buds. 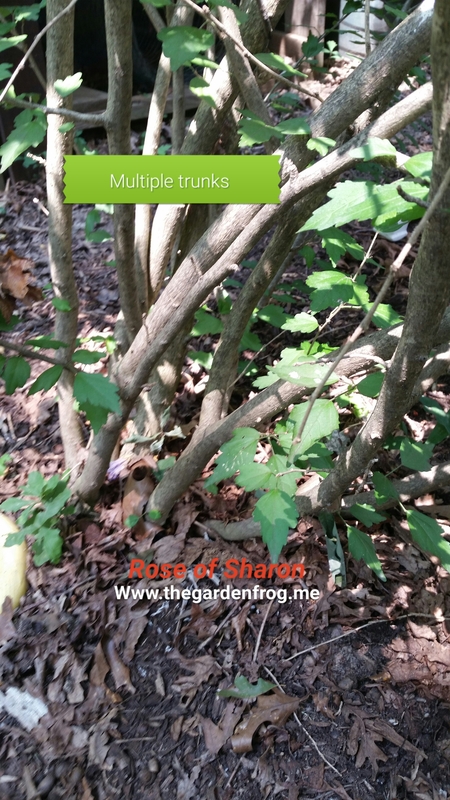 This is a late bloomer and would not be a good specimen tree for any garden because the leaves emerge much later than most other deciduous shrubs and trees. 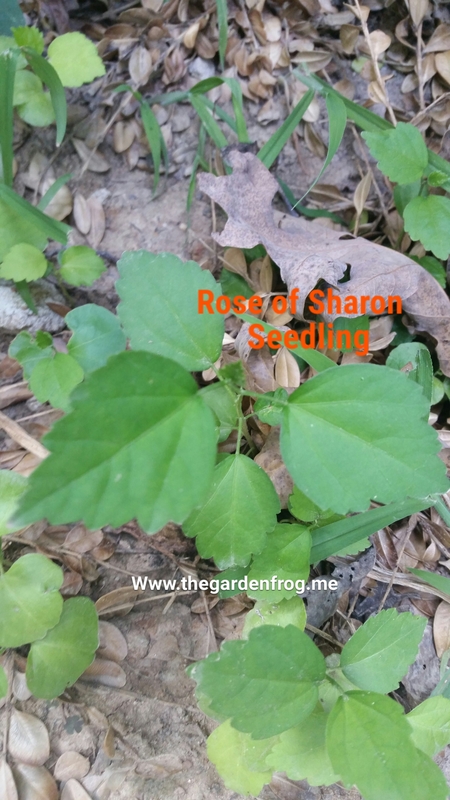 The Rose of Sharon does make a great hedge and I would think about mixing it in with some sort of conifer, evergreen, or arborvitae for winter interest. 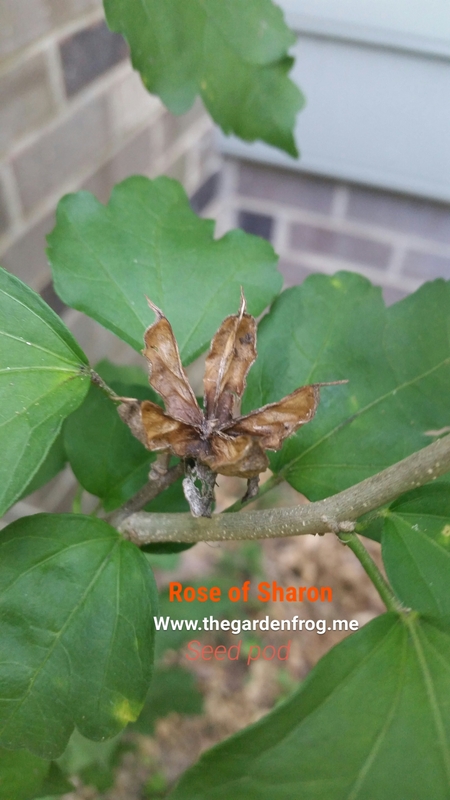 The Rose of Sharon can be controlled by simply cutting off thee seed heads before the pods turn brown and burst open. If the seedlings emerge, you can simply pull them out of the ground. I threw down seeds late last summer and this spring they emerged. These are fast growing plants. 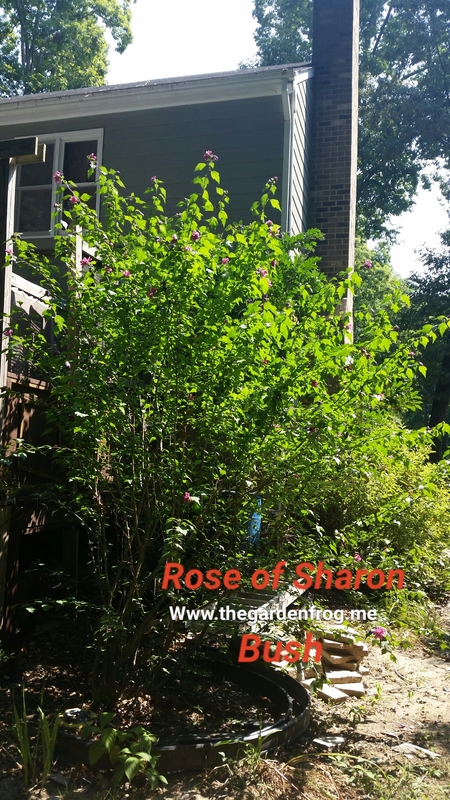 The first year they will grow less than a foot but by the 3rd year my Rose of Sharon tree has reached over 6′ tall. Now I live in zone 7 so I have a longer growing season and a milder winter but I would venture to guess that a foot a year growth until it reaches maturity is not over stating how fast they grow. 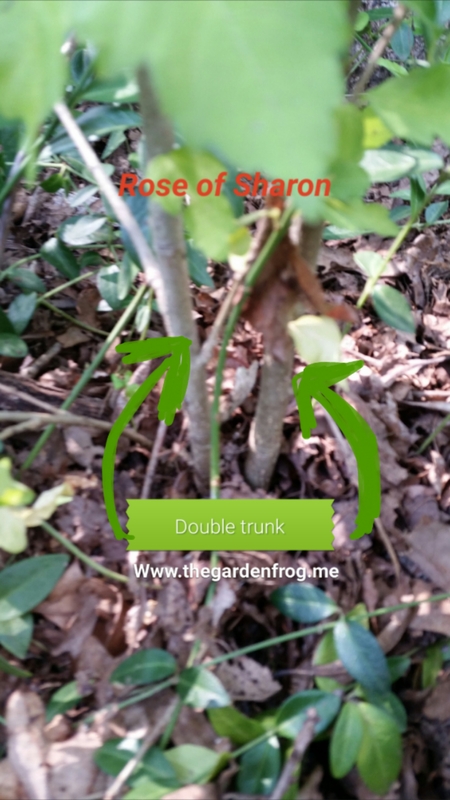 The Rose of Sharon can be pruned to control its size. I am not a pruner so I let (most of my) plants do what they will. If you do want to prune I would wait until the last flower blooms and fall arrives to prune to shape for next year. You can also prune in early spring and shape the plant (some gardener says for bigger blooms). 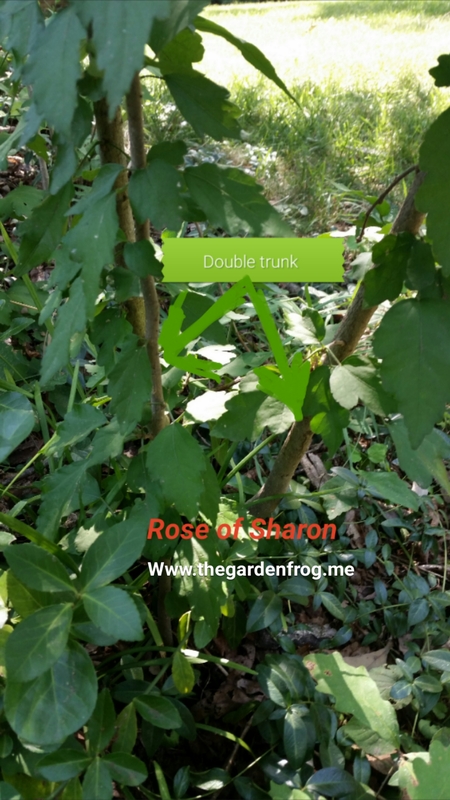 The Rose of Sharon can be a bush, tree, or even an espalier (which is training the plant to grow along a fence or wall). There are new cultivars you can find at garden centers and nurseries which are smaller and are not invasive (because the plant does not produce many seeds). The bees love them which is a plus in my book. 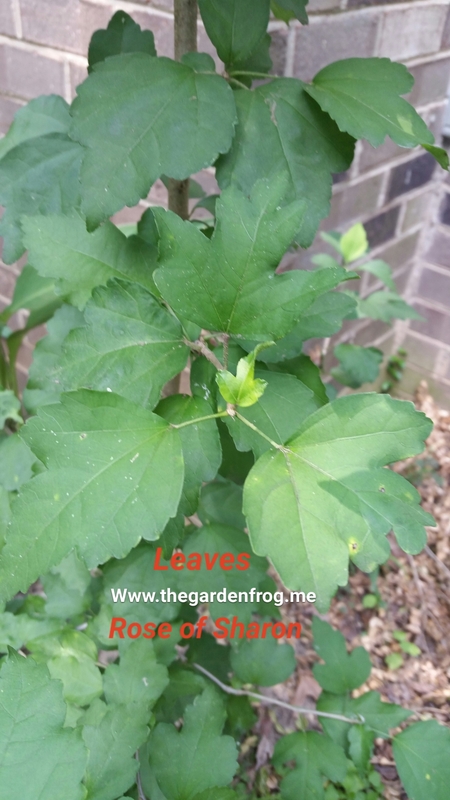 The Rose of Sharon also tolerates my dry, red clay soil and life under Oak trees which is another reason I have them. I have so many seedlings because I do not prune off the seed heads. It is easy to identify them and pictured below I have a close up of the leaves for you to use to identify them on your hunt. I would save the pictures and go for a walk in your neighborhood and see who has them. I would ask the gardener (or property owner) if they would mind if you took some seeds or dug up some of the seedlings. Many people will share and asking is so much better than just taking. I have transplanted these in the heat of summer with great success. Watering is the key to success and transplanting before, during, or after a rain is my secret. Happy gardening everyone and if you ever have a question, just ask. Great article, I rely really enjoy these plants. Have them all over our yard. Just planned them on our church grounds. We live in Mobile al. 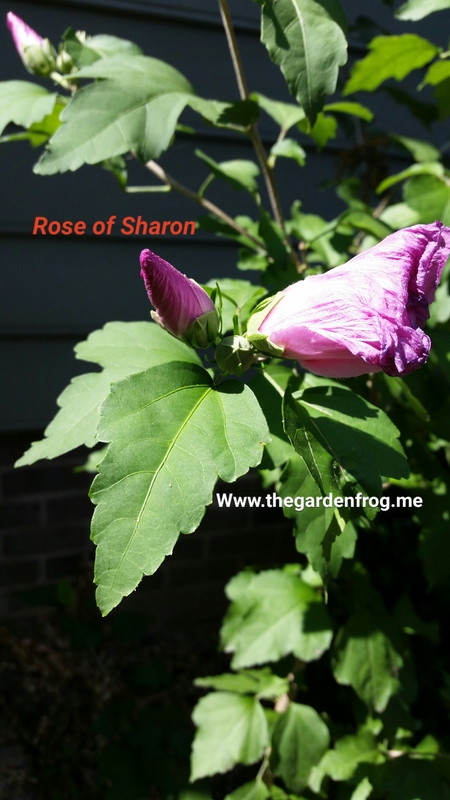 this article on rose of sharon was extremely helpful. you are a very good writer. i have understood more than from this article. thank you for sharing! 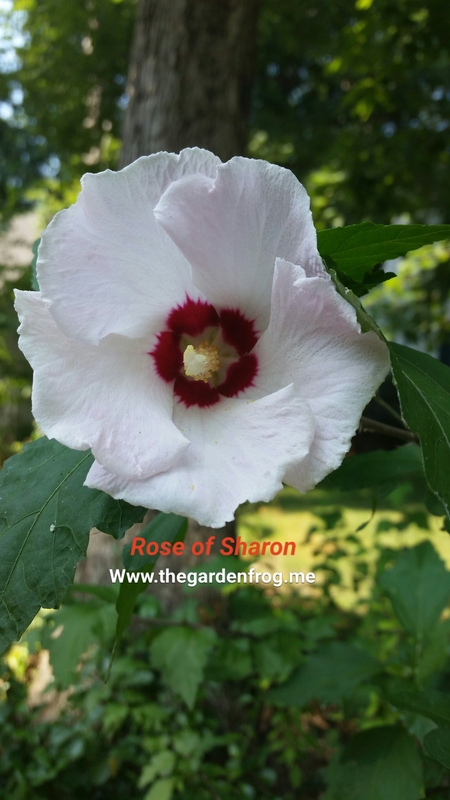 Hi we just transplanted a 5 year old rose of Sharon and we did it right before a good soaking rain in the end of July in NJ. We have checked the soil and it has been moist and its in the shade. My leaves are drying up completely-not falling off yet, but it looks bad. Is it just stressed or is it dying do you think? We did put a bunch of garden soil around roots to give nutrients to clay soil. 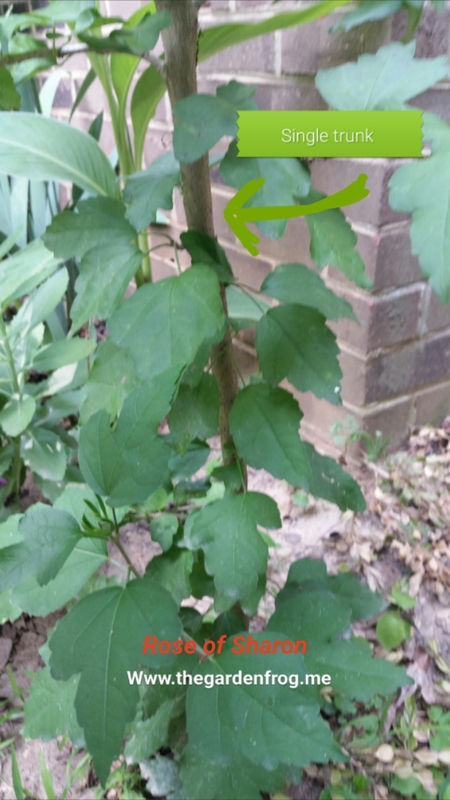 I have something strange going on with a Rose of Sharon bush in my backyard. It has always had both pale pink flowers with a red center as well as lavender ruffled blooms. I assumed that the previous owners grafted two together many years ago. But this year, dark pink ruffled blooms joined the party. I remember a fews years back the catalogs sold Rose of Sharons that had many colors. I am wondering if that is what you have. What surprise you get when a new color pops up! I got 12 seeds from a friend. They were from the bush, a purple with a magenta center. 9 of the 12 grew. I now have 6 after giving 3 away. Out of the 6, 3 are the purple with magenta center, one is a pale pink with the magenta center and one is pure white. One has not flowered. They are 3 years old and I have the seed pods from all the plants. I have shared some. I am waiting for the all white and the pale pink to give up the seed pods this year for the friend who gave me the initial seeds as she has NEVER seen a white on!! Loved the article. I find this too- the seeds sometimes are not the color of the plant they bloomed. It is fun to wait and see what colors! but you have to watch the seeds! Nature has given me a white one and a darker purple Althea, but both are too close to the house😔 Hopefully they survive a move to another part of the yard. I ordered online what was listed as a “Red Rose of Sharon” with double blooms last year,It just bloomed this year and its a pink double bloom! I’m kind of upset because I was really looking forward to Red.My question is could it be I was lied to on the sale Or is it something to do with my Soil Ph? It should bloom sparsely at 2 years experience in zone 7.I do not do anything special but start with Alaskan fish fertilizer and keep mulched. They bloom summer they do not life to be planted to deep either. Visit me at my Facebook page and send s pic to see if I can see anything obvious. Hi. I believe I’m also in zone 7 – Charlotte, NC. Three years ago, I purchased two Rise if Sharon’s. One is single purple. It flowers ok, but not great. The flowers don’t last, but only a day. Is that normal? The other is a double pink. It is loaded with pink buds, but, disappointedly, they don’t open I’ve only seen two fliers. They’re very pretty, but very small. They also lasted only a day. What’s wrong? I was told to leave them alone because they’re very hard, and ake care if themselves. Although, they have grown to 4-feet tall, they’re not what I expected. What should I do? Since I was told to leave it alone, the only water it gets is when it rains. I do not fertilize it. I have not trimmed it back. Is it begging for love and attention? Please help. Thank you. I’m so sorry for all the typos. I’m a disabled stroke survivor, and forgot to proofread. I hope you understand what I wrote. If not, please ask. Thank you. Dear maggie. I am sorry I did not get to this sooner. My life has been a bit of a challenge lately living in a camper with limited internet. 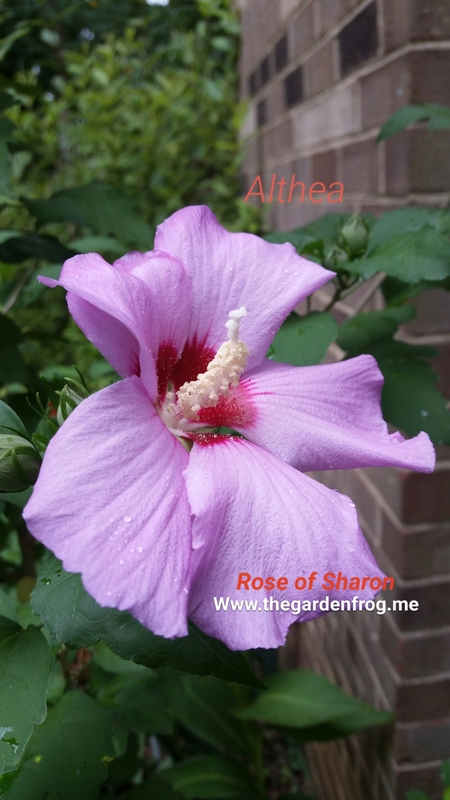 Your rose of sharon sounds like it needs a dose of Alaskan Fish Fertilizer every week for about a month. It is what I use to help ailing plants. 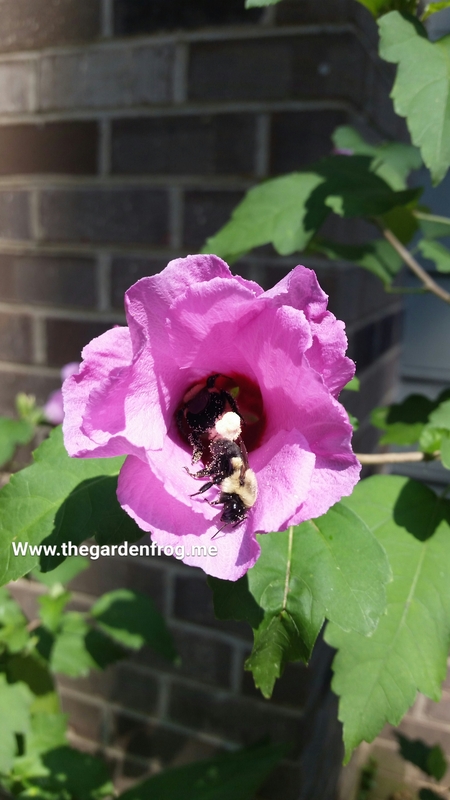 I am wondering why your buds are not opening because Rose of sharon do not need any special care. I would fertilize it with the fish fertilizer available at Lowe’s or home depot and sometimes walmart. stinks! also put 4″ mulch but leave space around the base of the plants. single purple should be be loaded! so I am thinking your soil. So first try my remedy and let’s go from there. Good article! I am a new owner of an Althea Tree. I did not remove the seed pods, so now I have new leaves arriving. Should I remove the brown pods now? Thank you.